Dijon potato salad with eggs. Ham, feta, mushroom and broccoli frittata, is pictured at top; pasta salad with egg and balsamic dressing is above. I recently saw a statistic that 80 percent of Americans celebrate Easter Sunday and of those celebrants, more than half will serve ham for the holiday. About 180 million eggs are also sold each Easter. That’s a lot of ham and eggs. Once the Easter bunny has come and gone and dinner is over, many of us will be packing leftovers into the fridge. Leftovers that will hopefully be put to good use. So what do you do with all those leftover dyed, hard-boiled eggs? They work well mixed into pasta or potato salad. Warmer spring weather means outdoor gatherings and barbecues will be on many people’s to-do list, so this is a great time to try some new pasta or potato salad recipes. 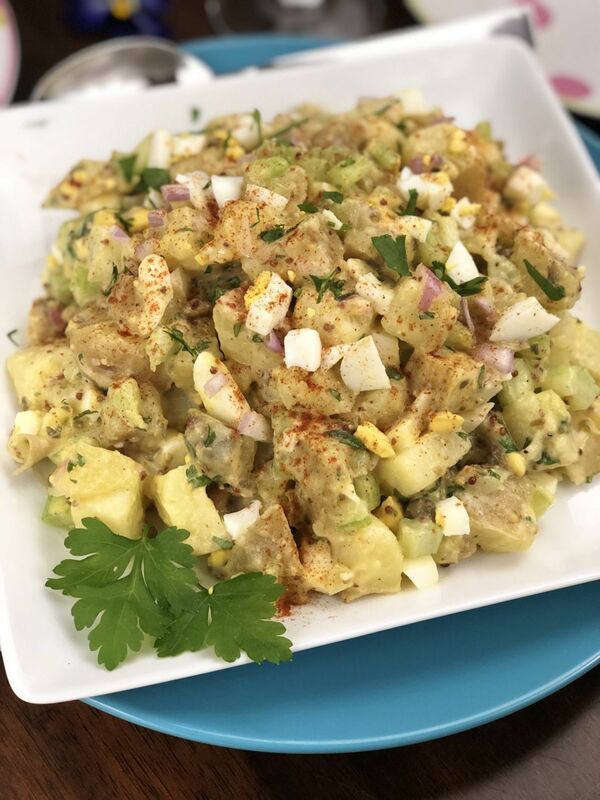 I made a potato and egg salad with a creamy Dijon dressing that was a hit with my family. Instead of using a store-bought mayonnaise as a starting point for the salad dressings, I whisked olive oil into an egg yolk (use a quality olive oil, and not extra virgin, to create a tasty, homemade mayo), then seasoned it. Fresh lemon juice, Dijon mustard, balsamic and red wine vinegars are all good options to whisk into your dressing. The Dijon dressing was perfect for the potato salad and I came up with a creamy balsamic dressing for a pasta and egg salad. The results were (pardon the pun) egg-cellent. Leftover ham can be chopped up and added to a quiche or a frittata, which is basically a crust-less quiche. 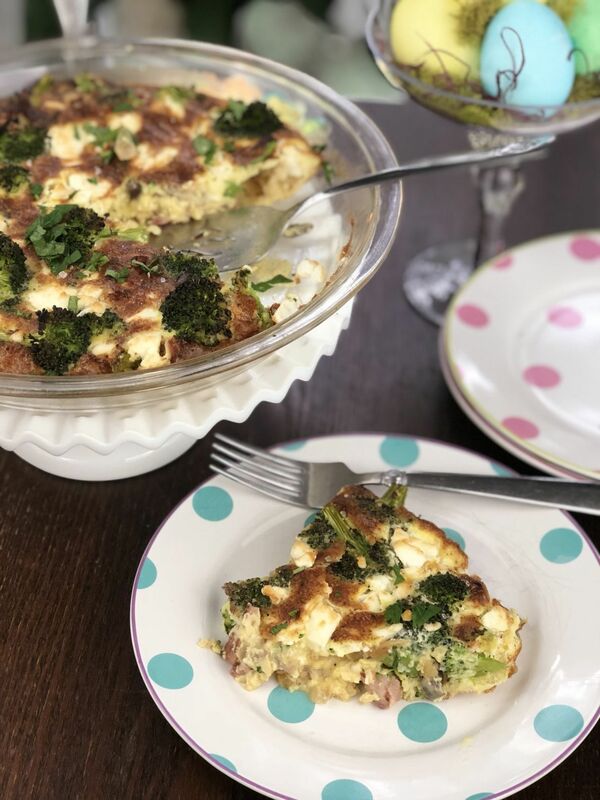 Pair the ham with broccoli, mushrooms and feta cheese and you will have an egg-citing and easy brunch dish or a quick dinner that uses up all that leftover ham. Whatever your Easter Sunday entails, I hope it’s full of joy and good food. Set a sauté pan over medium-high heat. When the pan is slightly warmed, add the olive oil and garlic. Cook for one or two minutes or until the garlic is fragrant and lightly browned, then add the onion, ham and mushrooms. Cook for 4 to 5 minutes or until onion is softened and translucent. Add the broccoli and cook for an additional minute, then set aside. Turn on the broiler of an oven and add the butter to a 9-inch glass pie pan. Set under the broiler to melt the butter and turn the dish a few times to evenly distribute the butter. Add the ham mixture in an even layer to the pie pan, then set aside. In a mixing bowl, whisk together the eggs, milk, salt and pepper. Pour the egg mixture over the ham mixture, then sprinkle with crumbled feta. Set under the broiler with the oven rack at medium height in the oven and cook for 4 to 5 minutes, checking every couple of minutes. When the top is lightly browned and the eggs are set, remove from oven. (If the top is browned and the eggs are not completely set, turn the oven to 350 degrees, cover with foil and return dish to oven to cook for an additional 3 to 5 minutes, or until the eggs are no longer wiggly). Garnish with parsley before serving, if desired. Set the potatoes in a sauce pan and cover with cold water, then set on the stove and cook on medium-high heat. Bring the potatoes to a boil, then reduce heat to medium and simmer for about 12 to 15 minutes or until the potatoes are fork tender. Remove from stove and drain, then rinse with cold water to cool the potatoes. Drain again, then spread on a baking sheet and set the potatoes in the fridge to further cool and dry for about 30 minutes. Put chilled potatoes in a large mixing bowl. Add the egg, celery and parsley. Whisk an egg yolk in a separate mixing bowl. Stream oil in slowly, whisking the entire time, to incorporate the oil into the yolk. The yolk should begin to get creamy and somewhat thick. Slowly stream in the vinegar while whisking, then whisk in the lemon juice. Add Dijon mustard, salt, pepper and shallot and whisk together. (To adjust the flavor to suit your taste, add additional vinegar, lemon juice or salt). If the dressing is too thick, thin it with a little water. Pour the dressing over the potato and egg mixture and toss to coat. Garnish with paprika, if desired. Cook the macaroni according to package directions, then drain and rinse with cold water. Once the pasta is cooled and drained, set in a large bowl and place in the fridge to chill. While macaroni is chilling, make the dressing. Add an egg yolk to a mixing bowl and whisk. Stream the olive oil in slowly, whisking the entire time, to incorporate the oil into the yolk. The yolk should begin to get creamy and somewhat thick. Slowly stream in the balsamic vinegar while whisking, then whisk in the lemon juice. Add salt, pepper, brown sugar and shallot and whisk to combine. If the dressing is a little thick, you can thin it with water. Adjust the flavor to suit your taste by adding in a little more vinegar, lemon juice, salt or pepper. Remove the pasta from the fridge and add to a large mixing bowl. Add the eggs, peppers, onion and parsley. Pour the dressing over the pasta and mix well, then garnish with basil before serving.